Saturday night, our last night in Portland, I knew it would hard to top Higgins. We needed something special, so returned to the advice of the Patron Saint of Portland. 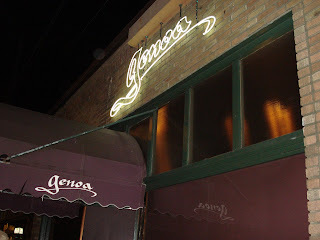 He had heartily recommended a locals only place called Genoa, and since he hadn’t led us astray yet, I made reservations. It was a long cab ride, across the Willamette River and deep into the neighborhoods of Portland. We pulled up to a rather inconspicuous location. I was worried; this would either be a great meal or some cheesy Italian restaurant complete with red checkered tablecloths and candles in Chianti bottles. Thankfully, it was a tastefully decorated interior with barely a dozen tables. Even though we arrived on time, the party at our table was in no hurry to leave, so we were shown to the lounge/private dining room, and enjoyed several glasses of nice spumanti. Thanks to a talkative waiter from Georgia who noticed our accents, a conversation was quickly struck up and it ended up with us being invited to see the kitchen. It seemed pretty small, and I’ve noticed that the chef seems to be glaring at me in every picture. But it’s like my grandma told me, if a restaurant won’t show off their kitchen, you shouldn’t eat there. After a 30 minute wait, we were finally seated. We were delighted to hear that our drinks from before were on the house. With that behind us, we took a look at the menu, and it was a dozy, a six course menu. We started out simply enough. 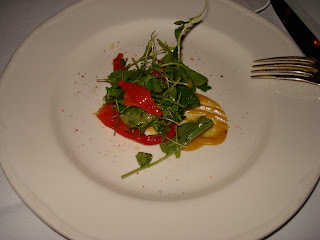 A salad of roasted piquillo, smoked poblano, and yellow pepper-citrus puree with pepper cress sounds like a mouthful, but it was a little on the small side. 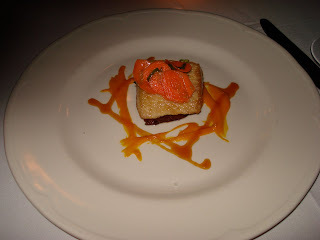 However it was packed with a wonderful mélange of flavors. One of best things about the meal was that my dad and I couldn’t decide on a bottle of wine that would work with all the dishes. How was the problem resolved? The sommelier gave us individualized wine tours. 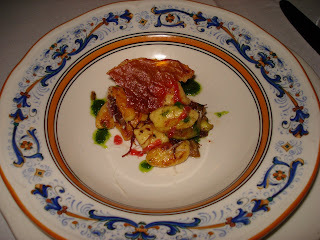 For the salad we enjoyed a Coppo Brachetto D’Acqui “Pasione,” Piedmont, Italy 2006. Needless to say, our waiter and sommelier were kind enough to give us a copy of the menu, but they went above and beyond the call of duty by giving me a menu with each of our course selections and the corresponding wine. Without the kindness of the wait staff, this review would have been useless. 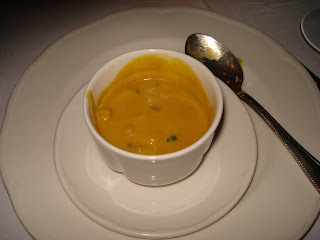 The second course was a sweet meat pumpkin chowder with fresh Manilla clams and bacon. I was surprised that gnocchi was featured so early in the meal, as it is usually a dish that sits in your stomach like a brick. That was not the case at Genoa, as this was the lightest gnocchi I have ever eaten. I only wish there had been more of the crisped prosciutto. The wine continued to be a tour of Europe with a Saint Cosme Côtes du Rhône “Les Deux Albion,” France, 2006. Now the fourth course is where we took our separate paths. I choose the pork belly, because I can’t resist pork belly. It’s a terrible weakness and one that I should really work on some other time. As I said, armed with our forks, we had reached a fork in the road. 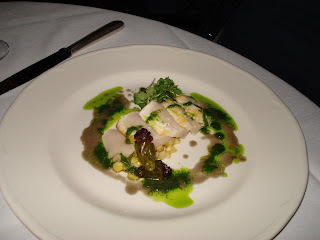 While I went with the pork belly, my dad choose escolar, a delightful white fish. By now you would think we would be rolling out of chairs, stuffed to the gills, and miserable, but that was from the case. 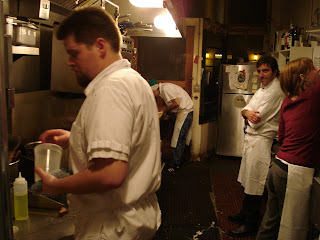 The cooks at Genoa have learned the perfect portion for each course, and we were primed for the fifth course. A Kookoolan Farm’s Guinea Hen with buttermilk-chestnut purée, apple, and foie gras greeted my father for his fifth course. 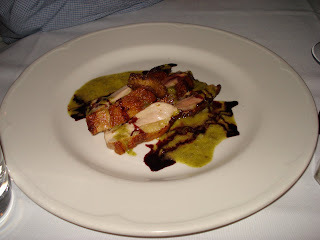 This was one of the few dishes on the Genoa menu that centered on fowl, and while it may not be done often, it was done well. I loved how succulent the meat was, and yet the skin was so crispy. My dad enjoyed the first domestic wine of the evening with the course, a St. Innocent Pinot Noir “Villages Cuvee,” Willamette Valley, Oregon, 2006. I know it seems odd to pair a dark red like pinot noir with the Guinea Hen, but we had trusted the sommelier for the entire meal, and he did not disappoint with this combination. 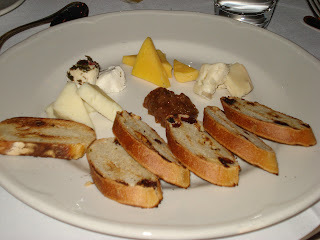 The planned menu culminated in a cheese plate, a plus in my book. What we have here is pecorino sardo, a fleur vert, land haus, and gorgonzola cremosa dolce. I’m typically not a fan of gorgonzola or blue cheese in general, but I enjoyed every single one of these cheeses. They went delightfully well with the homemade raisin bread and the Felsina Vin Santo della Chianti Classico, Tuscany, Italy, 1999. Now here’s the terrible truth, there were more courses to this meal. An amuse bouche, a delightful sorbet before the desert, the deserts that we just had to have. Unfortunately, I can’t remember enough to do them justice. You’ll just have to take my word that they were delicious. Choice words for Genoa are hard to come by; unassuming, prepared, perfection, these could all be apt for Genoa and her wait staff. 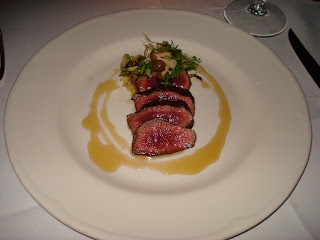 The bottom line is, had it not been for the wait, which was not bad at all, considering it included delightful wine, conversation, and a kitchen tour, this would be best meal on the trip. For now, I’ll say it was the best in Portland, while Lotus of Siam might be the best in Las Vegas. I honestly can’t laud the wait staff, the chef, the cooks, and particularly our sommelier enough. They were all engaging, loved their job, and made this a memorable meal and the perfect punctuation to our trip out west. If I were you, I would avoid the restaurant on matter of principal. 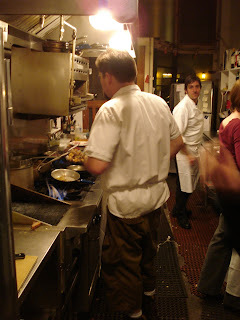 The drunken manager rampages through the restaurant every night - sexually harassing the female workers and putting the head "chef" in his place.... when a restaurant is run by a drunk and not the chef... it should be avoided. My name is Adam. I was the executive chef at Genoa and the person responsible for this food menu when you ate there. I just happened to stumble upon your review and I just wanted to think you for your extremely kind words and your appreciation for the food. It makes me very happy to know that you enjoyed your meal that much.